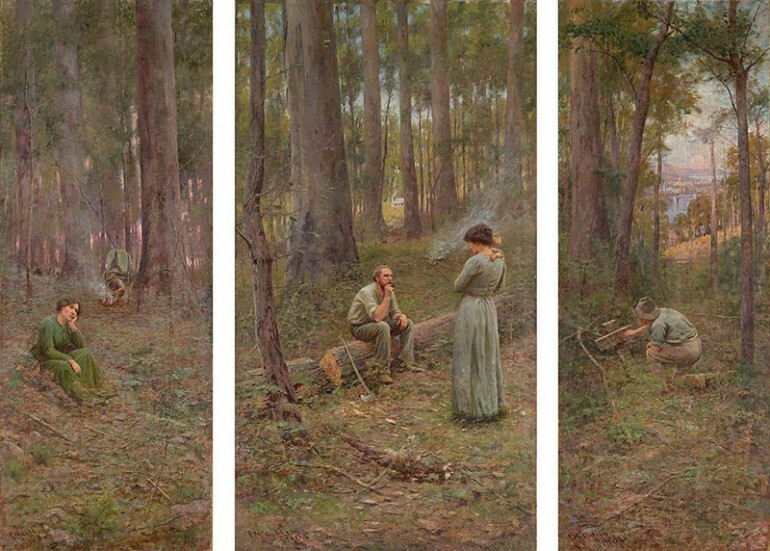 Prominent Heidelberg School artist and Australian Impressionist painter Frederick McCubbin was born on February 25, 1855 in Melbourne, Australia. He was one of the most important artists in the history of Australian visual arts. He received his education at Williams Willmett’s West Melbourne Common School as well as at St Paul’s School. He took several part time jobs while he was enrolled at the School of Design of the National Gallery of Victoria, working at a solicitor’s office, helping out in their bakery business as well as being a coach painter. He studied under Eugene von Guerard, an Austrian-born landscape artist who specialized in truthful naturalism in the depiction of his landscapes. McCubbin met Thomas Roberts in the same school, who also took lessons from von Guerard. The artist also had art lessons from the Victorian Academy of the Arts where he has exhibitions in 1876 and in 1879 up to 1882. In 1880, he sold his very first painting, ‘View Near Fisherman’s Bend,” but had to stop concentrating in his art career for a while to manage the bakery after his father died. He was 25 at that time. McCubbin, who was one of the foremost members of the Heidelberg School of Australian Impressionism, used a style that resembled European Impressionism in its light-centered approach and loose brushwork. Together with Charles Conder, Arthur Streeton and Tom Roberts, they set up their plein-air painting sojourns in outlying areas around Melbourne. Like his contemporaries, he was an excellent landscape artist, but he was greatly interested in creating what he termed as national pictures that were meant to portray the people working in the Australian bush, such as the swag men, miners, sheep-shearers and pioneer settlers. These people showed the rugged character and egalitarian spirit of Australia that was starting to emerge as a nation at that time. McCubbin created several large-scale genre paintings that featured rural labor, including masterpieces such as “The Pioneer,” “A Bush Burial” and “Down on His Luck.” Tom Roberts did the same things as well as Streeton, although only to a lesser extent. Their works showed what typical life in Australia was during those pioneering times. McCubbin was later appointed as an instructor of drawing at the National Gallery of Victoria’s School of Design. He taught there until he died in 1917. Most of the Impressionist paintings he produced resonated deep passion for the working class pioneers, which was the soul of the settlers in the country. In the year that he sold his first painting, he started to receive more attention and the National Gallery awarded him several prizes for his works. In 1882 he received a silver medal in figure drawing and the following year he was the top prize winner for best studies in drawing and color. Afterwards he was named as an Academy Associate. He was offered the post as instructor and master in the National Gallery’s School of Design and had many students. Several of them became prominent artists in Australia, such as Charles Conder and Arthur Streeton. 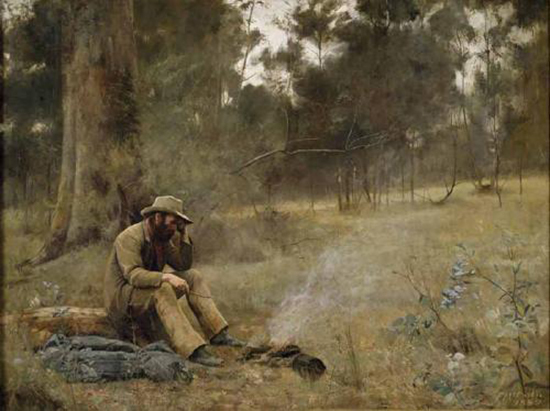 Several full-time artists headed by McCubbin and Tom Roberts broke away from the Victorian Academy of Art in 1887. They formed their own group called the Australian Artists’ Association. He exhibited during the art shows mounted by the group. Their association was consolidated a year later with the Academy and renamed the Victorian Artists’ Society where he was appointed as a councilor. In 1903 and 1906 he was elected president of the society. He participated in the art shows of the society until 1912. He and seven other artists left the society in 1912 to form the Victorian Art Association, where he was elected as president. McCubbin together with Roberts, Conder, Streeton, Jane Sutherland and Clara Southern always gathered on the weekends to paint the Melbourne countryside. Their weekly painting trips marked the start of the Heidelberg School of Australian Impressionism, although their style was more formal than the style used by Pissarro, Renoir and Monet and closer to the naturalism of the landscape paintings of Barbizon School as well as the style of Jules Bastien-Lepage. The colors used by the Heidelberg painters were more subdued than the typical palette of the French Impressionists because they deemed them unsuitable to the conditions in Australia, as the country has its own unique color and the light is harsher. It was also their desire to create realist paintings that depict the reality of life in the bush accurately. In the final phase of his career, his paintings showed the influence of Camille Corot and JMW Turner.